“Children who learn to swim at a young age are reaching many developmental milestones earlier than normal” (2012 research by Robyn Jorgensen at Griffith University) research has shown that babies who swim regularly can roll, sit, crawl, walk and develop fine motor skills earlier than babies who have not swam regularly. Swimming not only helps develop our physical being, it also helps to reduce our stress levels, but increases our Love hormone (Oxytocin). This hormone is essential for building strong bonds. The best part of swimming with your baby is the undisturbed pool time allows you creates a strong emotional connection right from the start. 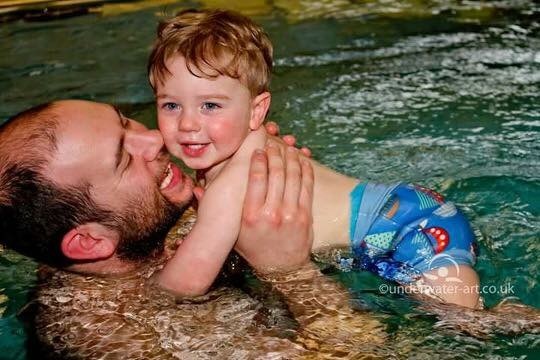 Started in 2012 with just a handful of excited new swimmers, Aqua Splash Tots has grown into Somerset’s largest independent, specialist Swim School. Our teachers are firstly parents themselves, they have all attended classes at Aqua Splash Tots before falling in love with our beliefs, and have then gone on to train as qualified swimming instructors. Our instructors have to complete there STA (Swimming Teachers Association) qualifications before then undertaking an intensive 10 week in house training programme. We regularly attend external and internal training days. With current DBS checks, First aid qualifications and extra rescue qualifications you can be assured that you and your little one are in the safest hands. Our courses are written with your little ones physical, cognitive, emotional and social development in mind. Each course is developed to ensure that all the activities are suitable for your little ones, we want to ensure that your little ones learn through fun structured courses. Each course is helping to make your little one water confident, water safe and water aware. Baby swimming is the most popular activity for little ones under 5 and is a fully inclusive activity. Swimming has many benefits for those with additional needs, being in the warm water, helps to relax and soothe muscles and joints, allowing more free movement than on land. My son Benjamin has just started his 2nd term with Aqua Splash Tots and he loves it. I myself love the water and really enjoy swimming so I thought it was a great idea to introduce Ben to swimming at an early age and I’m so glad I did. His water confidence is amazing and he is not phased by going underwater at all. My only regret is I didn’t start it earlier. Everyone at Aqua Splash Tots are great, there is such a fun yet relaxed atmosphere which is great for the little ones. If you are thinking of swimming lessons for your child then I strongly recommend it, it’s BRILLIANT!!!! Jessica and I love our swimming lessons on a Thursday afternoon. Jessica is just 4 months old but is already growing in confidence in and under the water! For me it’s great ‘Dad time’ bonding with my daughter and good to meet other parents – Jessica loves the interaction with the other babies. Our instructor makes the sessions really fun and encourages us to progress, especially with the underwater bits…and doesn’t laugh at me when I don’t know the words to the songs! We are about to sign up for our second term and would recommend the lessons to anyone who wants their child to be a confident swimmer. At this rate Jessica is going to be the next Rebecca Addlington!